A monk traveling around the provinces is enjoying the luxurious water irises in full bloom on the bank of a stream in the province of Mikawa, when a woman appears. She tells him that this place, called Yatsuhashi, is famous for water iris flowers. When the monk asks whether Yatsuhashi had been written about in an ancient poem, the woman tells the old story of Ariwara no Narihira who composed the poem, “Just as a karakoromo (Chinese robe) comfortably fits my body after wearing it a long time, I comfortably fit my wife. I however came all the way to the East, leaving her behind in Kyoto. Alas, it is heartrending to travel so far.” Narihira had used the five syllables of the word for water iris, “ka-ki-tsu-ba-ta,” at the beginning of each verse of the poem above. The sun eventually sets. While apologizing for the simpleness of her residence, the woman invites the monk to her hut for lodging overnight. She changes her apparel and appears, gracefully transformed, wearing a beautifully shimmering Karakoromo-style kimono, and a diaphanous headdress, known as a sukibitai. 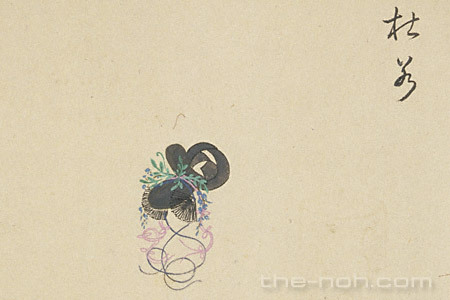 She explains that the kimono belonged to Princess Takako, who was mentioned in the previous poem, and the headdress was once owned by Narihira, who had composed the poem. She then reveals that she is the spirit of the water iris. She tells that Narihira had appeared in this world as the incarnation of a Bodhisattva of song and dance; he offered the light of salvation to all living creatures in the world and the words of his poems have the power to save even non-sentient plants. While reciting Narihira’s story of love and poetry recorded in the Tale of Ise, the spirit dances mysteriously and elegantly. Eventually she receives the merit of the Buddha’s law that leads even flowers and trees to Buddhahood. She achieves enlightenment and disappears at dawn. When we hear the story of Ariwara no Narihira including the five syllables in the word for water iris (ka, ki, tsu, ba, and ta), we cannot help but think of the beauty of the Japanese language, which harmonizes with the scenes of natural beauty. This episode splendidly represents the rich emotion and poetic nature in the Japanese language. This drama, “Kakitsubata” has only two characters, the spirit of the water iris (shite) and the traveling monk (waki). 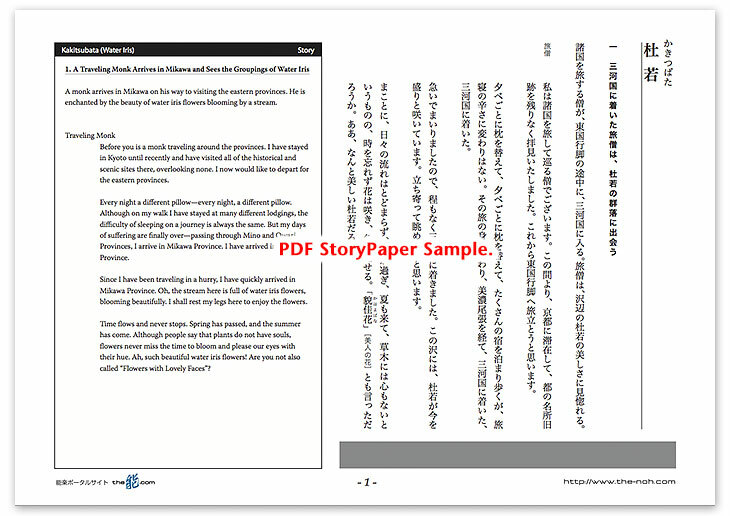 It is a short and simple story which is completed in one scene, something unusual to the style of mugen-noh. The highlight of this piece is surely the visionary dance and chanting of the shite, a female spirit of the flower, which seems to plunge her into a profound dream. She connects Narihira’s brilliant love with the merit of Buddha, centering on the story of “Azuma-kudari” in Ise Monogatari (the Tale of Ise). Please enjoy this world of refined verses and music, gorgeous costumes, and restful dance, intertwined with fleeting illusions infused with the fragrance of elegant aristocratic culture, with the poetic sentiments of the Japanese language, and with the sensations of brisk early summer as represented by the water iris.